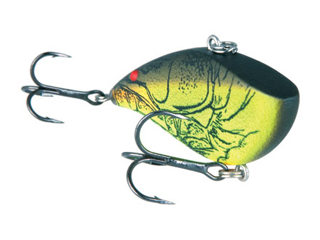 Lipless crankbaits have long been a staple lure for any bass angler, and it's no secret why. They cast a mile, cover water fast and effectively entice hungry fish with a rattling wobble that attracts bass from even the most secure cover. Several companies offer their own versions of the lipless crankbait in varieties of patterns, but Xcalibur's newest addition to their roster, the Xr50 series Real Craw, revolutionizes crankbaits with a number of features that raise the bar of lipless crankbaits to new heights. First and foremost, the Real Craw looks and acts like every fish's favorite crustacean in a way no other lipless crankbait has before. This is achieved through a paint process that actually creates the uneven, shelled texture of a crawfish through numerous layers of realistic paint colors. Available in seven realistic crawfish patterns to suit any conditions you may be faced with on the water, this finish also serves to create a very different style of water displacement not only during the retrieve, but also as it sinks with a swimming action when your line is slack, which drives bass wild. The most impressive feature of the Real Craw is that, unlike many other crawfish baits, it is actually painted to look like a swimming crawfish, in that it's made to appear as if it's swimming backwards. The textured pattern runs towards the rear of the bait, and ends with raised, red eyes at the tail that perfectly imitate those of a real crawfish and add more depth and realism to the bait in the water. Along with these great characteristics, the 2 1/2 inch, 5/8 ounce Real Craw boasts Tx3 in-line hooks (#4 on the belly, #6 on the tail) that tuck close to the body as it swims, reducing the chance of snagging, as well as extra-loud internal rattles that will be sure to bring in bass from great distances. With realistic, textured patterns that look and swim like an actual crawfish, the streamlined hook design, and attractive rattling vibration in the water, where else does the Real Craw have room to impress anglers? Well, once fishermen notice the easily affordable $6.99 price tag, this question finds an answer and every angler will want to fill their tackle box with each color in which the Real Craw is available. The innovative Xr50 Real Craw from Xcalibur really is the new face of lipless crankbaits, and sets the standard for other baits on the market. Any bass angler will definitely want to give this incredible lure a shot this spring, when bass fatten up on crawfish for the spawn. After pulling in your limit with this lure, the fish may not thank you, but at the end of the day, I'm sure the crawfish will.